This boat is brand new, and gorgeous - for day cruises she can take up to 15 passengers - maybe a few more. This boat has an excellent crew of three. Shashani is fast, so we can go places on day charters that we cannot do with the sailing boats / catamarans. For example we can cruise to the popular Phi Phi islands and back on a day charter. Our favourite and most popular cruise is to Maithon island, where the waters are crystal clear, the snorkelling good and there is a pod of Dolphins. 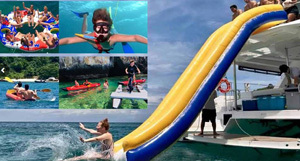 The crew will inflate the big slide from the top deck, and the floating jacuzzi. There are kayaks and fishing gear, snorkeling equipment and a Scuba set. There is good music and you can plug in your own device, and we have Wifi too. Further Destinations A cruise further afield incurs a surcharge. For Phi Phi or Racha Islands, or Krabi, add 22,000 THB. For Ko Hong Krabi add 13,000 THB surcharge. By paying the extra charge you will be able to continue your cruise, and disembark at 18:00 on the last day.